I haven’t posted a book review in a long time. I’m going to remedy that during the break. I may even post a few. I think I’ll review Patricia Polacco’s “January Sparrow.” It was such a fantastic book. I loved it like I love all of Patricia Polacco’s book. I honestly haven’t read a book of hers that I don’t like. Others that I think I’ll review are: Applemando’s Dream, Pink & Say, Mr. Lincoln’s Way, Bully, Junkyard Wonders, & My Rotten Redheaded Older Brother (in memory of Patricia’s older brother, Richie, who recently passed). I’ll kick them out over the break. Until then! I am so silly. I always forget what works for me. A couple of my students have been struggling. I’ve worked in Education for 10 years now. I should have pulled from my store of knowledge. But, sometimes we can become so overwhelmed that we forget (as I did) what works for us. Once I came to my senses, I quickly made fluency folders from pages I copied from Practicing Basic Skills in Reading & Practicing Basic Skills in Language Arts by Ray Beck, Peggy Anderson, & A. Denise Conrad. At first I only made fluency folders for the struggling readers. Then I realized that almost every student needs help in some capacity. So, although there are 7/15 students working on fluency, there are 8 students that are at or above grade level in English. However, they still have deficits. I have 4 students who need to work on appositional phrases, commas in a series, and commas for parenthetical phrases. Yes, all of that is in the book. It’s not cheap though. I looked on ebay, Amazon, & a couple of other sites for inexpensive copies, but did not find it. These books are $100. Pretty steep, but worth it. You could run a whole language arts intervention program for lower to upper elementary with this book. So that I won’t forget this for next year, I am going to keep a FORGETFUL folder where I record my ideas that work for me. Hopefully I won’t forget where I put it! : D!!! It’s a fantastic book. Check it out! 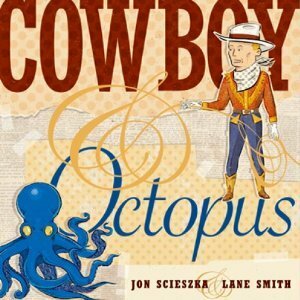 I have to say that this story, Cowboy & Octopus (2007), by Jon Scieszka and Lane Smith was not my cup of tea. I absolutely hated it. Why am I reviewing this book then? Well, I am reviewing this because Jon Scieszka, a former school teacher, writes books for reluctant readers (read boys), and he did his job with this one. I recently bought this book for $1 D.W. Discount Books’ going out of business sale. The price was so ridiculously good, I did something I don’t usually do, I bought it without reading it. I figured since it was Jon Scieszka, it couldn’t possibly be bad. Well, I was wrong. I read it, hated it and passed it on to Phillise, thinking my “grownupness” was getting in the way. Well, Phillise hated it too. So, bells started going off. Jon Scieszka writes for boys. Since that is the case, why don’t I give this book to a little boy and see how he likes it. I hit paydirt when I gave it to my neighbor’s 6 year old son. He laughed and laughed his little head off. “What is he laughing at?,” I thought to myself. By golly, he was laughing at the book. I got a further thought to try it with the boys in my class. My theory= of the fourth graders, it was my belief that two of my students would like it, since they are a bit immature; the other one, since he already has sophisticated tastes, would hate it. While the last student I was on the fence about. I figured he could go either way. My theories were correct. The immature ones liked it. The one I was unsure of, who I was on the fence about, despised it. The one with the sophisticated tastes, thought it was one of the worst books he’d read. None of my fifth graders liked it. So, my conclusion is that Jon Scieszka hit it out of the park with this one. I didn’t like it, but it wasn’t written for me. I am not the target audience- 5 & 6 year olds are the target audience and they love it. So, go out and get it for your little reluctant reader. Apparently they love it! Mind Your Manner B.B. Wolf (2007), written by Judy Sierra and illustrated by J. Otto Seibold is a fractured fairy tale of sorts. The title character, Big Bad Wolf (B.B. Wolf for short, is retired and now lives in Villain Villa Senior Center. He is up to his neck in bills. He’s fed up. His day brightens once he receives an invitation for tea. He decides to go with his best friend, Alligator.